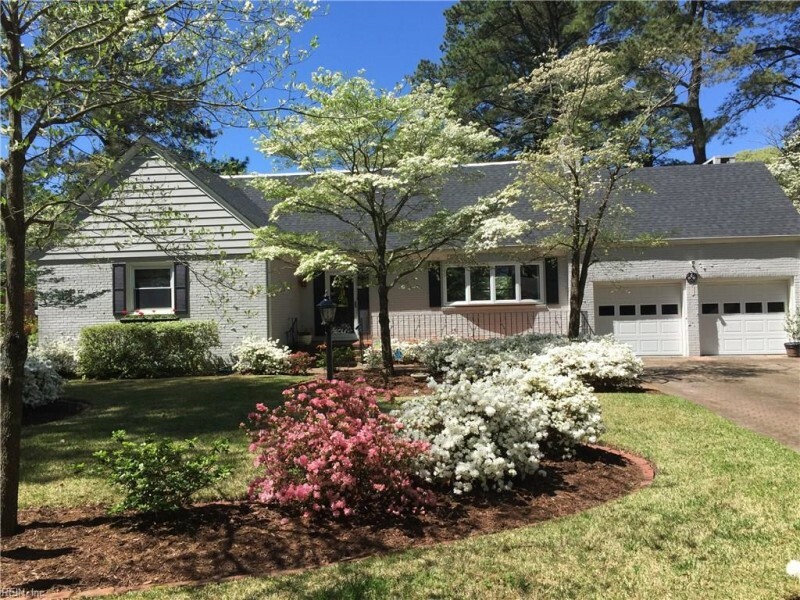 ENCIRCLED BY WHITE DOGWOODS IN FULL BLOOM, THIS CHARMING, DOVE-GRAY BRICK RANCH IN EVER-POPULAR LAKEWOOD SAYS SIMPLY, "HOME". YOU'LL KNOW IT AS SOON AS YOU ENTER THE INVITING LIVING ROOM WITH GAS FIREPLACE AND BEAMED CEILING, AND BEGIN EXPLORING THE COZY FAMILY ROOM WITH 2ND FIREPLACE, THE GRACIOUS DINING ROOM, AND UPDATED KITCHEN WITH ROOM FOR COOK + HELPERS! LIGHT LITERALLY POURS INTO THE LARGE ALL-SEASON SUNROOM. NO WORRIES WHEN IT STORMS: THERE'S A WHOLE-HOUSE GENERATOR! MBR AND BATH ON 1ST FLOOR, 2 BEDROOM AND BATH ON 2ND. BEAUTIFUL, NEWLY REFINISHED PARQUET FLOORING DOWNSTAIRS, COZY CARPET OVER HARDWOOD IN FAMILY ROOM. BRAND NEW ROOF, 2019. 2-ZONE AC: DOWNSTAIRS, NEW IN 2018; UPSTAIRS, IN 2016. IN THE HEART OF ONE OF NORFOLK'S LOVELIEST NEIGHBORHOODS, THIS HOME IS A MUST SEE. Open House Date: Saturday, April 20th, 2019 from 1:00 PM to 3:00 PM. Ready to visit 5643 Shenandoah? Request a free property tour! This 3 bedroom, 2 bathroom home located at 5643 Shenandoah, Norfolk, VA 23509 has approximately 2,985 square feet. It is currently listed for $414,000 and has a price per sqft of $13,869. This home is currently New Listing under the MLS#: 10252820. This listing is provided by Chandler Realty Inc..
5643 Shenandoah Avenue, Norfolk was built in 1952. It has Garage Att 2 Car, 4 Space, Off Street, Driveway Spc parking.The kitchen includes Dishwasher, Disposal, Dryer, Microwave, Gas Range, Refrigerator, Washer.